Dec 15, 2015 Dexaprine Original is BACK For a Limited Time: Doses Disclosed! For a limited time, iForce Nutrition has released a small production run of the Original Dexaprine Formula!! Grab it while you can - this stuff is insanely strong, so be on the ready! The primary version of Dexaprine that's in stock without DMAA is the XR version - See our Dexaprine XR page for more info - but that's not as good as this one in our opinions!! 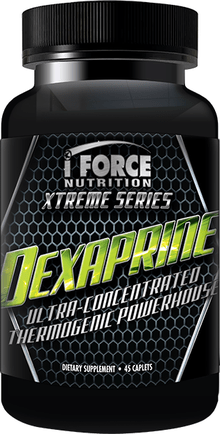 Iforce Dexaprine is an extremely potent thermogenic aid that promotes instant increases in energy levels, reduces appetite and cravings, promotes mood enhancement and protects lean muscle tissue. Dexaprine is called the Thermogenic Powerhouse because of its ability to promote lipolysis all day long. After you take Dexaprine for the first time, you'll soon realize why they call it the Thermogenic Powerhouse—it burns fat all day long! Iforce Dexaprine utilizes citrus aurantium extracted for synephrine and active amines, 1,3-dimethylpentylamine, caffeine anhydrous and theophylline to initiate fat lipolysis and keep your body in a fat burning mode all day long. These ingredients also stimulate muscle cell receptors so fatty acids are used as energy long before your body even thinks about using precious amino acids when dieting. 3,3 Diiodo L thryonine and 3,5 Diiodo L thryonine are included because they influence thyroid stimulating hormone and promote increases in metabolic rate and signal for muscle tissue to be preserved when in a caloric deficit. Overall, the ingredients in Iforce Dexaprine work together to give you an extremely effective and efficacious fat burning and muscle sparing supplement. How many fat burners have you taken? Now how many fat burners have you taken that actually worked?!? All the current fat burners on the market are the same. A little caffeine, a few obscure herbs, and more than likely some fast acting stimulants that give you a quick burst of energy followed by a nasty crash 1-3 hours later. If your fat burner stops working after 1-3 hours, how in the heck do you expect it to burn much fat when there is another 21-23 hours left in a day when it's doing nothing?!?! In order to burn the maximum amount of fat, we need to increase our energy and thermogenic output ALL DAY LONG, not just for a few hours each day. The key to prolonged and sustained fat loss is to maximize the half-life of the product. The half-life is a fancy way of saying how long the ingredients in the product will actually exert any effect on you. Dexaprine utilizes a specific blend of compounds to insure not only an intense immediate effect, but a sustained and dramatic all day long energy increase that isn't possible with any other fat burners on the market. Assess your tolerance to the power of Dexaprine by taking 1/2 a caplet on an empty stomach. After you've assessed your tolerance you may increase your dosing to 1 caplet on an empty stomach immediately upon waking. For only the most extreme athletes, an extra 1/2 serving may be consumed 6-8 hours later. Do not consume more than 2 caplets in any 24 hour period. Not for use by individuals under 18 years. Keep out of reach of children. Not for use by pregnant or nursing women. This product is intended for use by healthy individuals only. Always consult a physician before beginning dietary supplement/training program. Individuals with allergies to aspartic acid should not use this product. Do not use if you have a family history of prostate or kidney disease or endocrine condition. If you are taking any dietary supplement or prescription drugs, consult with your physician before using.